Boswellia Essential Oil, certified organic, 5 ml. Frankincense contains approximately 200 different chemicals and the properties vary enormously according to habitat and climate. It has long been recognized as one of the resins of choice for lifting consciousness towards the divine. Though often used as an incense, it can be taken internally in extremely small amounts, about one drop in a quart or liter of water that is sipped over two to three days. The oil has antiparasitic properties and can be handy when traveling. Boswellia serrata, the Indian frankincense, can be used topically on fungal infections of the skin and inflammatory conditions. It can also be added to a mouthwash or used to make your own mouthwash. 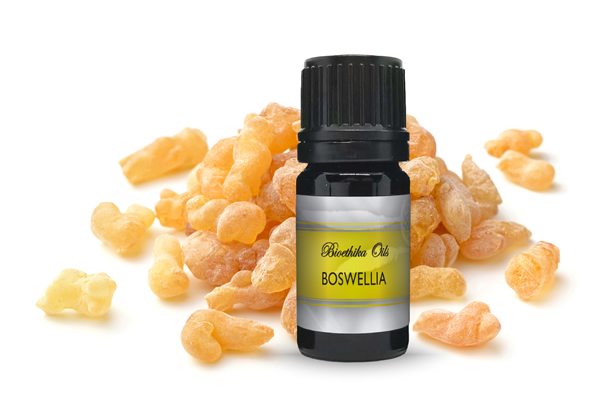 Because of its gumminess and thickness, Boswellia Essential Oil should not used in nebulizing diffusers. Contents: steam distilled certified organic Boswellia serrata oleogum resin. *The material provided on this site is for informational purposes only. The site owner is not a medical doctor. Information provided is not intended to replace the services of health care professionals. The content and products discussed have not been evaluated by the Food and Drug Administration. The information on this site and the products discussed are not intended to diagnose, treat, cure, or prevent any disease.